So now it’s Obama’s problem. Now, it’s a problem for the Democratic congress. And now, it seems the new truth is that addressing whether or not to allow them to expire – as designed by the GOP – is according to the GOP – just wrong, wrong, wrong. These guys are becoming the party of silly, silly, silly. 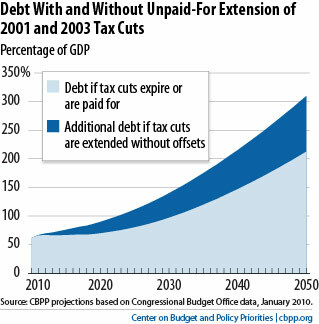 There is no policy that President Obama has passed or proposed that added as much to the deficit as the Republican Party’s $3.9 trillion extension of the Bush tax cuts. In fact, if you put aside Obama’s plan to extend most, but not all, of the Bush tax cuts, there is no policy he has passed or proposed that would do half as much damage to the deficit. There is not even a policy that would do a quarter as much damage to the deficit. This entry was posted in Congress critters, Politics and tagged Bush, congress, economy, Ezra Klein, GOP, Obama, Republicans. Bookmark the permalink.